Ubiquiti is a U.S. based company specialized in wireless technology. Ubiquiti has kept their costs down for example marketing mainly by word of mouth. UniFi is their WiFi brand. MikroTik is a Latvian company, that has delivered routers and other network equipment for the last 20 years. MikrotTik access points are fully fledged routers with a wireless card – and yet they are one of the lowest cost APs on the market. RouterBoard is MikroTik’s hardware brand. 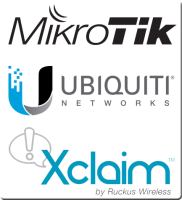 [Edit 8/2018: Discontinued] XClaim is the lighter weight brand of Ruckus, an established U.S. wireless company. Their product line is very compact, but the quality is Ruckus level. For example there are two 802.11ac access points: one for indoor use, the other for outdoor use. These brands share the price range in a couple of hunder euros, no annual licenses, centralized management and subdued, businesslike design. Centralized management doesn’t require a dedicated controller but runs as an application (that may even fit in your smartphone). A thousand euros will buy equipment to create a good network for a mid-sized office.